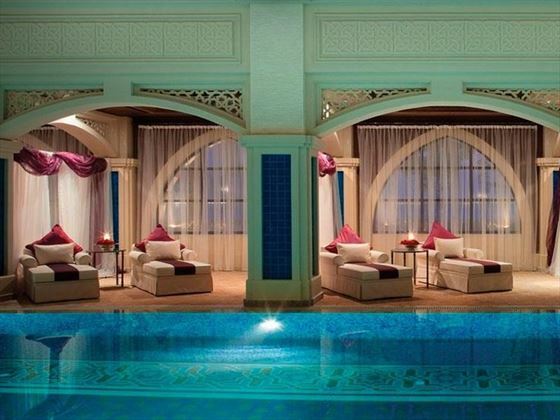 With its very own shopping arcade, boutique cinema, kids' club and more than 40 individual spa treatment rooms, it's easy to see why Jumeirah Zabeel Saray is ideal for couples and families alike. 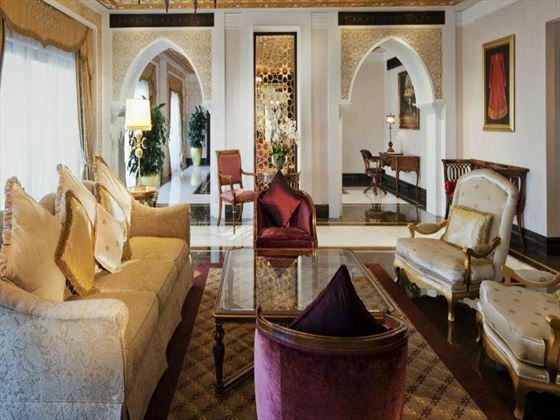 Designed in the style of a luxuriant Ottoman Palace, Zabeel Saray offers the resplendence and high levels of service that Dubai is famous for. 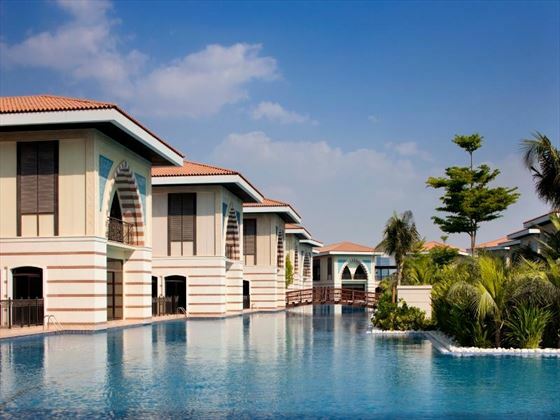 Located on one of the Palm's western fronds, around 45 minutes from Dubai International Airport, you'll find everything that you need right on your doorstep with easy access to the malls of Dubai and the resort's private beach providing the very best of both worlds. 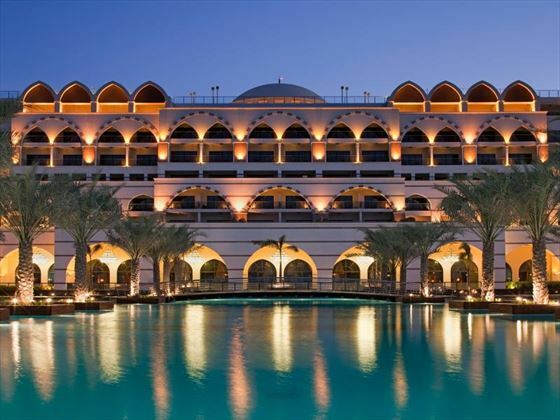 Tennis courts, a state-of-the-art gym and complimentary tickets to the Wild Wadi Waterpark provide plenty of active options and thanks to the resort's excellent range of restaurants, working up an appetite has never been so enticing. 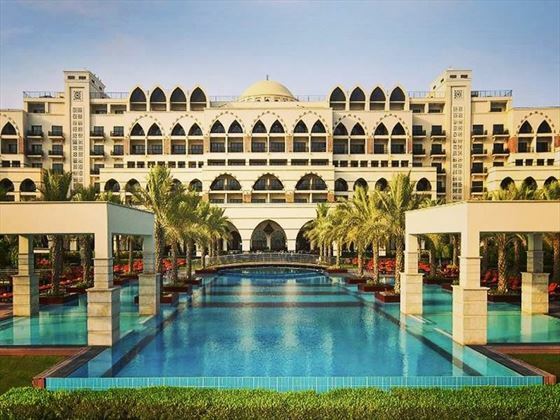 Further reading: Jumeirah Zabeel Saray is featured in our guide to the top 10 luxury hotels in Dubai and top 10 spa hotels in the world. 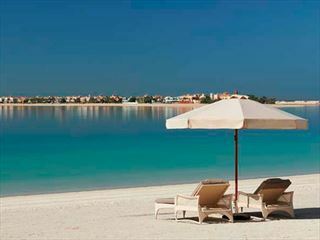 Jumeirah Zabeel Saray is located on the western crescent of the world-famous Palm overlooking the Arabian Gulf. 405 luxury guest rooms and suites, as well as 38 VIP villas, present a full-compliment of contemporary comforts and first-class amenities. 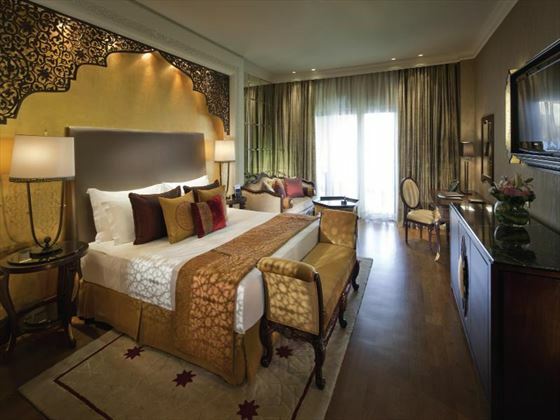 All rooms have been designed to recreate the elegance of the Ottoman era and the combination of indulgent décor and ocean views is really quite spectacular. 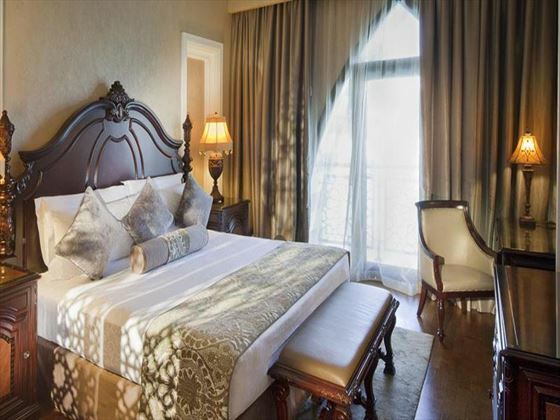 Superior King – Located on the 1st and 2nd floors, these opulent rooms offer 46sqm of indulgence, featuring a private balcony with views of Palm Jumeirah or the Dubai Marina, a comfortable king size bed, and a spacious bathroom. Superior Double – Lavish rooms perfect for a couple of friends or a family, these spacious 56sqm rooms offer two queen-size beds, a private balcony with enviable views, and a large signature bathroom. 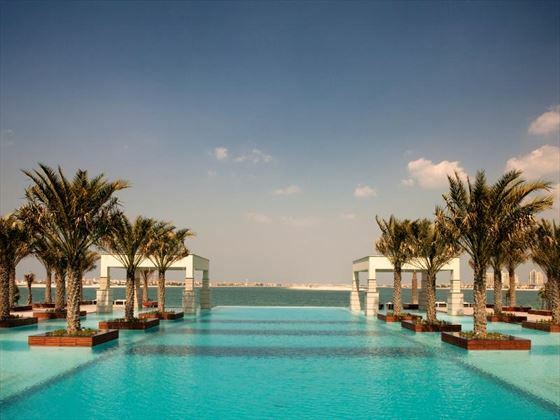 Deluxe King Arabian Sea View – Beautiful 46sqm rooms located on the higher floors, offering uninterrupted views of the sparkling Arabian Gulf, with a spacious king-size bed and signature bathroom with over-sized marble bath. Deluxe King Palm View – Also located on the higher floors, these 46sqm rooms have dynamic views of the Palm from its panoramic private balcony, as well as opulent décor and a spacious bathroom. Premium Deluxe King – Intimate 46sqm rooms nestled on the 3rd floor, with a scenic private balcony, indulgent bathroom, comfortable furnishings, and access to the Premium Lounge. The Premium Lounge offers extra space to relax and sip on complimentary teas, coffees and soft drinks and tuck into cocktail snacks, whilst evening selected house drinks are on offer daily from 7pm to 9pm. Premium Deluxe Double – With the same amenities as the Premium Deluxe King, with two cosy queen-size beds. Guests will also have access to the Premium Lounge. Club King – These are truly opulent 46sqm rooms, with panoramic views of the resort and the beautiful ocean, as well as a private balcony, Nespresso coffee machine, a large king-sized bed, and a spacious bathroom. Guests also have access to the Club Lounge – an extravagant lounge with Swarovski chandeliers, a la carte options for breakfast, all day tea, coffee and soft drinks, a complimentary lunch menu, afternoon tea, pre-dinner canapes, cocktails, and more. 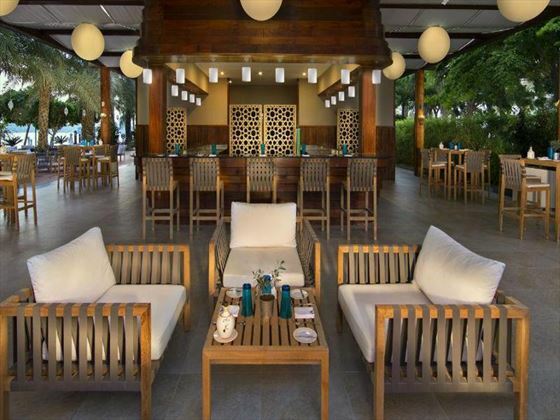 There’s even an al fresco seating area for you to enjoy the lounge’s amenities, and you’ll get private luxury airport transfers to and from Dubai International Airport. Club Double – With the same amenities as the Club King, this time for two large queen-sized beds. Guests also have access to the Club Lounge. 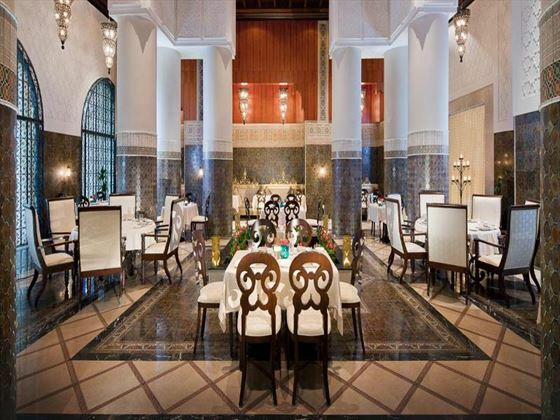 Al Nafoorah - Lebanese cuisine within a regal, yet relaxed, indoor/outdoor setting. Opening times: Saturday - Thursday 2pm-11pm. Friday 7pm-11.30pm. 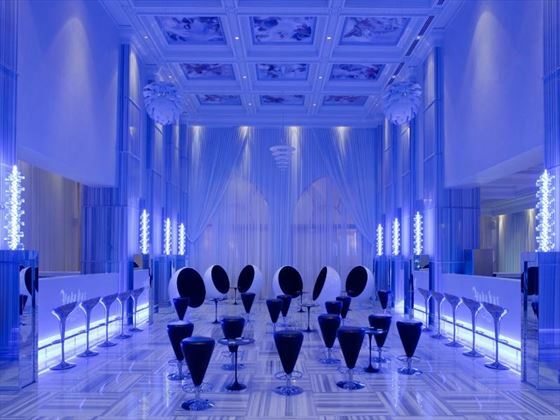 Club Lounge – Pause from shopping in the Avenue of Indulgence at this spacious and opulent lounge bar. Opening times: breakfast 7am-11am, afternoon tea 2pm-4pm, pre-dinner canapes 6pm-8pm. The holy month of Ramadan will be celebrated in the late summer (05 May 19 - 04 June 19 - subject to change). During Ramadan, Muslims all over the world abstain from food, drink, and other physical needs during daylight hours. 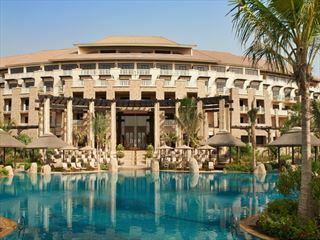 Offering some of the most luxurious and stylish accommodation in Dubai, Waldorf Astoria features its own private beach as well as lavish facilities perfect for relaxation and indulgence.